No, this is not a new version of The Da Vinci Code or Angels and Demons by Dan Brown. This is a true cryptic story, gruesome and very secret still. It concerns a likely assassination attempt on Pope Benedict XVI, the Turkish Secret Service and a horrible, ritual killing of an Archbishop with the murder shouting " Allah Akbar!" trying to cut his head off. A member of an informed secret service told this to the World Security Network because he wanted to point out the continuing, lurking danger of an alleged Islamic and as well nationalist extremism in Turkey. The world press reported only in passing on the superficial, visible side of the story: on June 3rd, 2010, Murat Altun, who had worked for four years as chauffeur and assistant, stabbed the highest-ranking Catholic in Turkey, Archbishop Luigi Padovese in his home in the small southern city of Iskenderun near the border to Syria. The Chairman of the Catholic Bishops in Turkey and Vicar of Anatolia was stabbed with a knife many times all over his body, with eight wounds in his heart and his head almost severed from his body in a ritual murder as an autopsy showed. The murder shouted " I killed the Great Satan" and "Allah Akbar! ", as the neighbors heard. At first the police told the public and Vatican officials that Murat Altun was "mentally unstable"- an official version the Turkish authorities always used when Christians were murdered in the past years. For this reason the Pope stated in a first reaction that this was "not a political or religious assassination but a personal matter". Most probably the Holy Father was not informed of all details and background by his administration and advisors in the first hours after the killing. Altun's lawyer later accused the slaughtered bishop of being "homosexual and having paid for services". Both accusations seem implausible and incorrect, and were put forth to distract the Vatican and the public from the dark secrets of the Turkish Secret Service. The perpetrator had worked for years as an informant to the Secret Service, whose services got out of control. The Secret Service itself became uneasy, and thus undertook an unusual step: An important figure warned the Archbishop of his confidant and that he had now become a danger. This individual in the Turkish Secret Service deserves the highest praise, as he thereby most probably hindered a new assassination attempt on the Pope. Both men - murderer and Bishop - were registered for the highly important Synod of Bishops with the Pope in Cyprus scheduled for June 4-6th, 2010 (read documents from the Vatican Apostolic Journey to Cyprus (June 4-6, 2010) and Synod of Bishops). The murderer would have been able to be in the immediate vicinity of the Pope - perhaps armed with a knife or a pistol - only few meters away from the Holy Father, without having to pass a security control as he was to assist the Bishop, carrying his mitre and prayer books. The Archbishop was one of the most important representatives of the Catholic Church in this important Islamic country and his participation in the synod a must for his Church and himself. Even though the security measures for Pope Benedict were improved considerably with bodyguards following the embrace by the disturbed woman at the Christmas mess in 2009, the murderer would have been able to come as close as his Bishop making any attempt to kill him easy. As you could see in the video coverage of the Synod, many people were allowed to greet the Pope and approach him directly. The Bishop was aware of how dangerous this situation could be for the Holy Father. On June 2nd, just one day prior to departure for this so critically important council, he cancelled the flight tickets for himself and his dangerous companion. This showed clearly that the threat was directed against the Pope and not the bishop himself. Luigi Padovese wanted to protect the Pope in Cyprus from any danger from his chauffeur. the Italian priest and journalist Filippo di Giacomo reported this to the Spanish newspaper "El Pais":" His apparent concerned was that the 26-year-old could come near the Pope." Seeing that his plan had been thwarted, Murat Altun murdered the Archbishop the next day out of revenge in a ritual killing according to so-called "Islamic" rules and rites. The Bishop was buried later on June 14th in his Italian homeland. The Vatican administration and the Turkish government first agreed to play down the matter as the important Synod was still meeting on the politically sensitive island of Cyprus which is still divided still between a Greek and a Turkish area. And there remained various areas of conflict to still be solved as well between the Church and the Turkish state. The Turkish officials used disinformation to distract from the truth and background of this unique killing and have no interest in the hole truth and background. Rome wants Turkey, which is striving towards Europe, to finally guarantee religious freedom and thereby the legal entity of the Church, as well as access to all old churches and the education of priests. 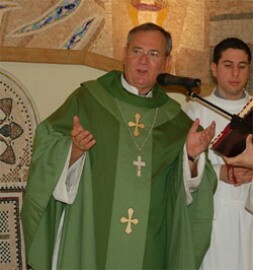 “On June 3rd, 2010, Murat Altun, who had worked for four years as chauffeur and assistant, stabbed the highest-ranking Catholic in Turkey, Archbishop Luigi Padovese (picture) in his home in the small southern city of Iskenderun near the border to Syria. The Chairman of the Catholic Bishops in Turkey and Vicar of Anatolia was stabbed with a knife many times all over his body, with eight wounds in his heart and his head almost severed from his body in a ritual murder as an autopsy showed. The murder shouted " I killed the Great Satan" and "Allah Akbar!" Following the assassination attempt on John Paul II in 1981 by the Turk Mehmet Ali Agca (on behalf of the communist Secret Service in Bulgaria acting as a puppet of the KGB to neutralize the Pope's influence in Poland), this would have been the second time a Turkish citizen had attempted to kill the leader of the Catholic Church. The perpetrator now sits in prison and is there subject to various state influences and manipulations regarding his testimony. Latin Archbishop Ruggero Franceschini of Ismir, requested to "know the whole truth about the motives of the assassination". An independent, international investigation including the Italian Ministry of Justice is needed now as was demanded by the Turkish Prime Minister in the case of the killing of Turkish citizens on the Gaza aid ship, along with a new religious freedom in Turkey. The international investigation must interview the murder and have access to the files of the Turkish Secret Service. Most probably he was being used by someone acting behinds the scenes still unknown, either from the Turkish nationalist or the radical Islamic movements. The present government in Ankara can learn from the Prophet Mohammed who repeatedly invited Christian delegations to his first mosque at Medina, prayed with them and even allowed them to stay there with his associates. Ankara should more forcefully state that criminals such as Murat Altum or Mehmet Ali Agca do not speak for Islam, but on the contrary mock and ridicule it. Altum should be cast out of the Ummah now. 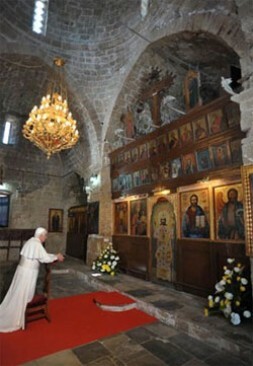 Pope Benedict XVI stated in Cyprus: "No one can remain indifferent to the need to support in every way possible the Christians of that troubled region, so that its ancient Churches can live in peace and flourish." The silent majority in the Occident and Orient should state openly what Christianity and Islam really stand for, and isolate defilers of the true Islam. Islam has its roots in the Old and New Testaments as well, which forms the basis of this newest religion with the Prophet demanding from all Muslims respect for Jesus and the old Scriptures. We allow ourselves to walked all over by a few crusaders of hatred. How much more effective it would be if we all would only propagate together the golden nuggets of tolerance and respect which make our global village lovable and liveable - the Human Codes of Tolerance (see www.codesoftolerance.com). This newsletter is dedicated to Michael Forster from Bonn, Germany, one of the few independent military analysts in Germany and founder of www.geopowers.com. He dedicated his life to the search of the truth, writing with an unique mixture of disclosure, deep digging into details, and background. He passed away too soon.